Drag is open to everyone! In fact, that’s one of the cornerstones of drag culture: everyone is accepted. One of the MC's at the Grand Valley drag club show. In addition to her job as an MC, she was also a performer. What do you think of when you think of drag culture? Wild outfits? Extreme makeup? Maybe even the show “Drag Race?” Drag culture is something that most people have heard of, but that a lot of people don’t know much about. What’s more, anyone can enjoy drag culture right here in Grand Rapids, and may not have known it! 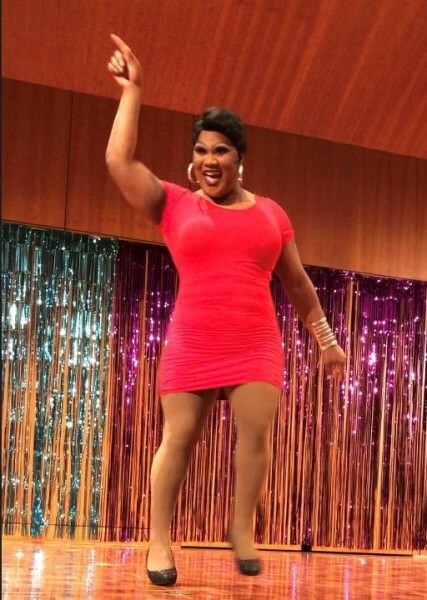 The information in the article comes primarily from the drag shows I have attended, specifically a show at Rumors Night Club and a show put on by the GVSU drag club. The information consists of my observations, as well as conversations with people familiar with the drag community and a Q&A with the GVSU drag club. Drag is open to everyone! In fact, that’s one of the cornerstones of drag culture: everyone is accepted. Most of the drag community is made up of members of the LGBTQ community, but heterosexual people are more than welcome to participate in drag as well. Drag queens tend to be cisgender queer men, but as previously mentioned, this is not a requirement. There are even drag kings, who tend to be cisgender queer females, though drag kings are not nearly as prevalent as drag queens. According to Jake Carter, one of the queens at the GVSU drag show, "Drag is a big middle finger to gender norms." This is part of the accepting nature of the community: you can be whatever you want to be. Drag personas tend to be the opposite gender of the person doing drag, but this isn’t a rule. Carson Garety, an individual who is familiar with the LGBTQ community, defines for us bio queens and bio kings: these personas are the same gender as the performer. They dress up in wild, creative outfits and makeup just like the gender-bending performers. People who do drag can form drag families, as explained by King Ra'Shun Ross: drag families have titles mirroring regular family titles, such as “drag aunt,” and “drag uncle.” This is part of what makes the community so closely knit: they can literally create their own family. What Happens at a Drag Show? Drag shows usually involve the performers lip syncing and dancing. Though the queen or king does spend time on stage during their act, they usually don’t stay there. Drag performers dance out into the audience to collect tips and connect more personally to the audience. Performers might even lightly touch some of the audience members, usually people in the front row. Tips are not a requirement, but they are a long standing tradition. Tipping queens and kings shows appreciation for their performance. Between performers there are usually MC’s, another big part of audience participation. The MC in a drag show is often sassy and humorous. Like the performers, they also go out into the audience, and even give the microphone to an audience member and ask them to say something. Audience participation is a huge part of what makes the drag culture so exciting: the bold energy of the performers is shared with the audience. There’s a lot of shouting to show excitement in response to MC banter and impressive performance moves. The atmosphere of a drag show is energetically intoxicating--in a very positive way! Where can Drag be Found in Grand Rapids? Despite its religiously conservative population, Grand Rapids is actually a thriving city for members of the LGBTQ community, which translates to the drag community as well. According to experiencegr.com, Grand Rapids is “one of 20 or so Michigan cities that have outlawed discrimination on the basis of sexual orientation, gender identity and gender expression in both housing and employment.” (Follow the link at the bottom to read more.) This makes Grand Rapids a safe and rich environment for drag. The nightclub “Rumors” has made a name for itself as the most well known drag hub in Grand Rapids, with shows happening on a weekly basis. “Drag Brunch” is another establishment with regular shows. These are the main places that have shows on a consistent basis, but drag shows aren’t tied to a regular venue. Performance halls such as the DeVos Performance Hall can schedule drag shows. These shows are often advertised on physical flyers as well as on websites. Even the Grand Valley Allendale campus has drag shows, which are put on by the Grand Valley Drag Club. In addition to shows, drag can also be seen at celebrations such as Pride. Some performers can even be hired for private parties. Why do People do Drag?